It has been so wonderful to see the snow melting, and the grass starting to show - spring is finally on it's way! I am working on getting the house ready for spring, and with that came the idea of making a spring wreath. What's even better is that is cost me $2 and some time, and I love how it looks on my mantel! Step 1: Cut or tear the streamer in 3" to 15" strips. They don't have to be perfect. I used all different sizes to fill in the entire wreath. You can tear pieces as you go, but in the beginning it helps to have a bunch of pieces already cut to help the process go a little faster. *I used about 3/4 of a streamer roll. Buy more streamers than you think you'll need. You don't want to run out in the middle of a project! Fold the streamer in half, length-wise. Knot or ball up the end of the streamer. Hold the knot/ball with one hand and twist the strip with the other. Twist the fabric around the knot/ball to create petals. You can try wrapping tighter or looser for different looks. *Always twist in the same direction that you started with! Keep twisting and turning to create a rosette. 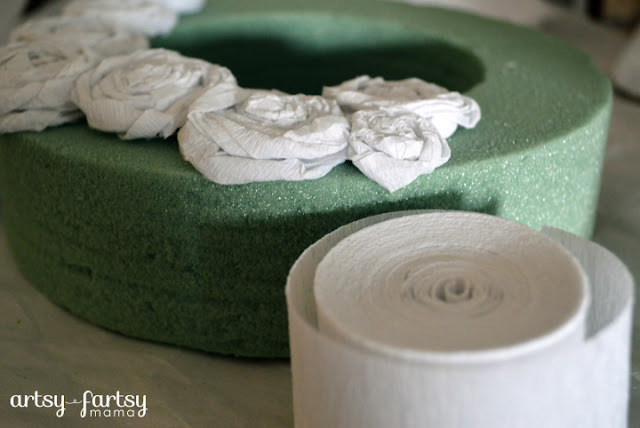 Add drops of glue to hold as you go if your rosette keeps unraveling. Glue dots also work great! Fold the end of the streamer under the rosette and carefully glue the end down. Prepare to possibly burn your fingerprints off!! Step 3: Glue each rosette on by adding a circle or glob of glue on the back and holding on the wreath for a few seconds. I found it easier to make rosettes and glue them on as you go. Make larger ones first, then fill in with smaller ones. Step 4: Repeat steps 2 & 3 until the wreath is covered. Back the wreath with felt or paper to protect the foam. You're done! Hang on the wall or display on a shelf or mantel. I highly recommend not hanging it outside. This is a fun and easy wreath to make while watching a movie, or when the kids are sleeping. Looks good! 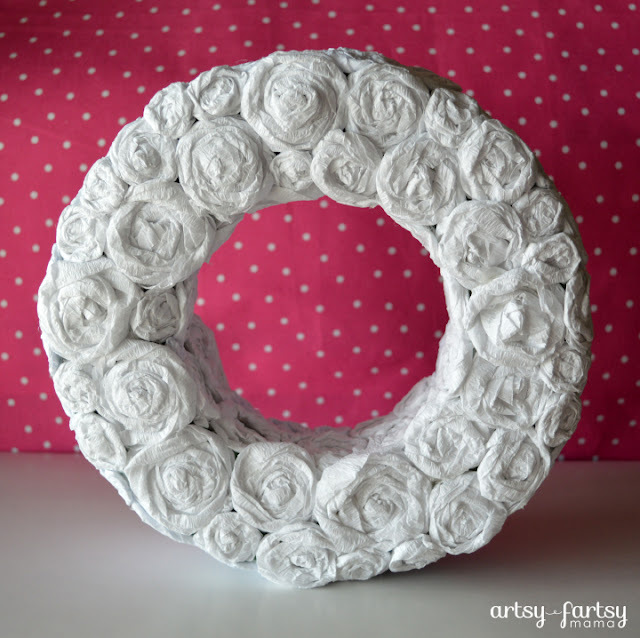 I bought streamers a few years ago to make little roses for a wreath... and gave up because it took forever! I came across the streamers yesterday... and you have inspired me to try again! Lindsay this is so beautiful! I love, love the all-white (and I'm normally not a big wreath fan)! Fun idea! I haven't tried the rosettes in crepe paper yet... they look great! I found you today at DIY By Design's Linky. I hope you get a chance to stop by my blog and leave a comment, too! Lindsay! I LOVE this! Its looks so elegant with the white! So cute!! I would love for you to share this at my link party going on right now and anything else you would like!! i love this!! I bet it took you for ever to make all those roses. :) Looks great! That looks awesome! I love the rosettes, the whole wreath looks fantastic. Lindsay, I absolutely LOVE this wreath! It's gorgeous and you can use it for the entire year since it is not holiday specific! ciao vengo dal Winter Blues Wednesday - It's a Party #108 e trovo che questa ghirlanda sia fantastica, che pazienza a fare tutte le rose!!! So cute! 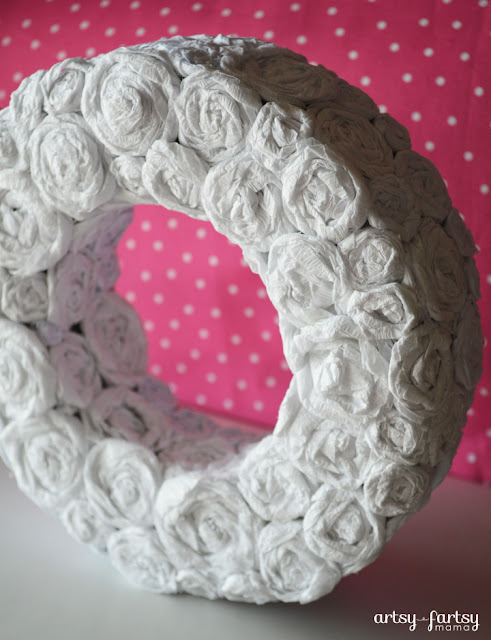 I want to make one of these for my baby girls room! Thanks for the tips and tutorial! What a lovely wreath - and how patient you were to cover it completely! I love that! Hard to believe it's just crepe paper and styrofoam.